To view the full conference brochure please click on the image opposite. 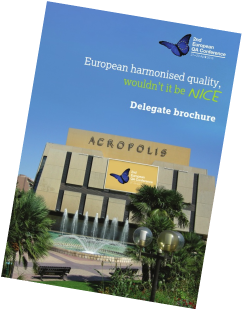 The Delegate Brochure includes the full programme (including Session Chairs and Speakers) together with hotel accommodation information for the conference hotel - Novotel Nice Centre and other useful information. This is Europe's largest QA conference and an excellent opportunity for all European QA Societies to promote and share experiences, consider regulatory and guidance updates and to exchange information and hear from European regulators. The conference offers excellent networking opportunities for delegates to meet their industry colleagues and renew old frienships. Included with your full conference package is a ticket to the pre-dinner drinks and dinner dance on Thursday evening. Two day delegates can also purchase a ticket for this event. (Please note this package does not include the Pre-Dinner Drinks Reception and the Dinner Dance on Thursday. Seperate Dinner Dance tickets need to be purchased for this - see below). Tax (where applicable) is currently 20% in France. All conference cancellations must be received in writing. For all cancellations an administrative fee of 100 Euros will be charged. Please note that the organisers cannot be held responsible for any liabilities caused by the potential cancellation of the conference due to unforseen circumstances. The organiser cannot accept liability for accidents, injuries and losses that might occur. The conference programme is subject to modifications. By booking online you are agreeing to these terms and conditions.